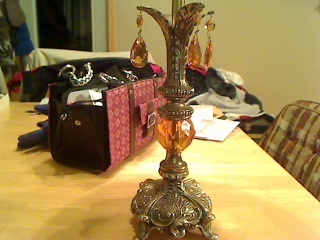 it's missing one of the sets of crystals ... so I will probably replace them all ... the detail in the metal is beautiful!! ... 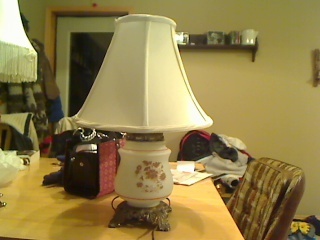 I think it will just need a new shade and a clean-up and will be ready to go! $10.00!!! It's very cool too!! 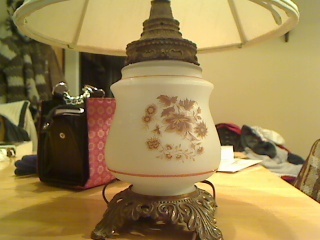 L & L 1973 lamp - there's a small bulb in the base that lights up as well. and see if the tacky flowers will come off - then try to paint or stencil something fun on it ... any suggestions? Love your blog, super cute! Love the ideas too, so inspiring! I agree with the notion to swap the two shades around. I think they look fine as is but I think swapping them would make them look even better. Hey, I can't find your e-mail! Can you write me so I will have it. I need it for the Pay it Forward. Mine is manouvellemode@gmail.com. Thanks! Nice finds!!! 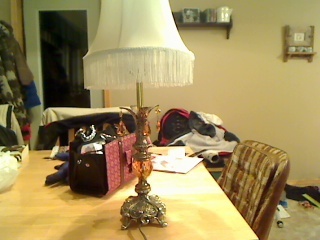 To me - getting the shade to fit the lamp is the hardest part! As for the finish - have you ever played with a lil Rub n Buff? That stuff is awesome and comes in every metal toned finish known to man. You literally just rub it on to add color and buff to shine! It is fantastic! Hi shanon, thx for stopping by on my blog, I'm your newest follower! !